Here is a guide, how to go from a webforms site to MVC hybrid, and all this can be done quite easy even on big sites without involving editors and without redoing their content. Do it agile, step by step, the result will be running Webform and MVC beside each other, just by migrating one template at a time, and then tell the editors to build all new pages with MVC. 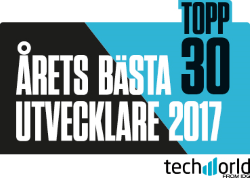 We’ve done this under 2016, with great success. 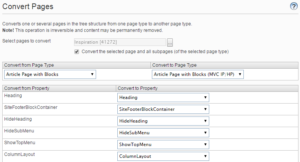 This method lets you also easily convert page types to the new MVC page types in “admin/content types/convert pages” built in function. 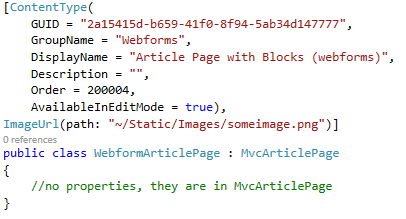 Create the pagetype model for the new MVC, by pasting all class content (properties and methods) from Webform model into new MVC model, and then inherit the Webform model to the new MVC model. GOT IT? YES! 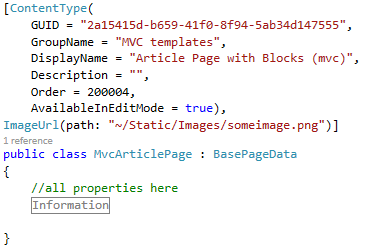 Then make your Controller, ViewModel and View to your MVC model. Put your logic in the ViewModel Constructor instead of the controller, and reuse the ViewModel on your .aspx.cs, so you only have the logic on one place. I won’t go in to details here so check a clean install of Episerver, and copy the files from Business-folder, you’ll need minimum to make and register a siteViewEngine with all your custom routing paths. Hang on… Create a pagetype model for the new MVC, by pasting all class content (properties and methods) from Webform model into new MVC model, and then inherit the Webform model to the new MVC model. 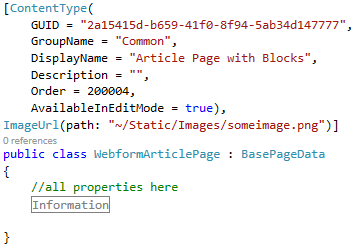 The webform page type must inherit of the MVC page type. The purpose of this is that the models will have the same properties. And easy to convert automaticly later on. Too much work rebuilding some .ascx controls? Render the ascx on an empty aspx that is requested with jQuery.ajax (an XMLHttpRequest), supplying context thru querystring, and place the rendered response HTML on your page. 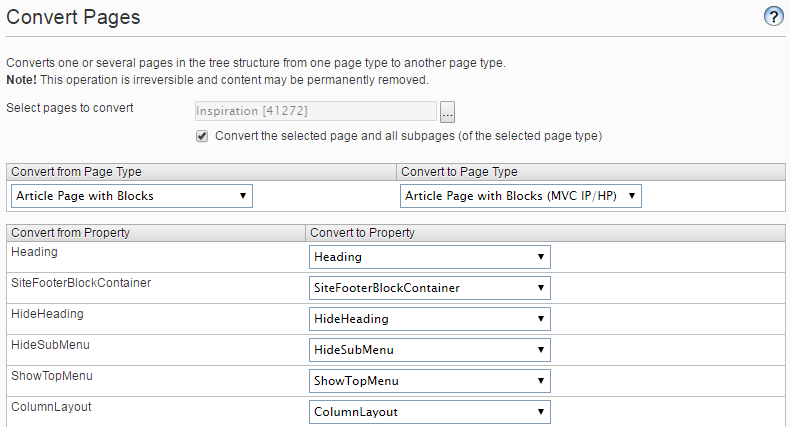 Now you can convert page types to the new MVC page types in “admin/content types/convert pages” built in function. Good luck and let me know how it went!